This frame is from an 1874 painting by Gilbert Munger. 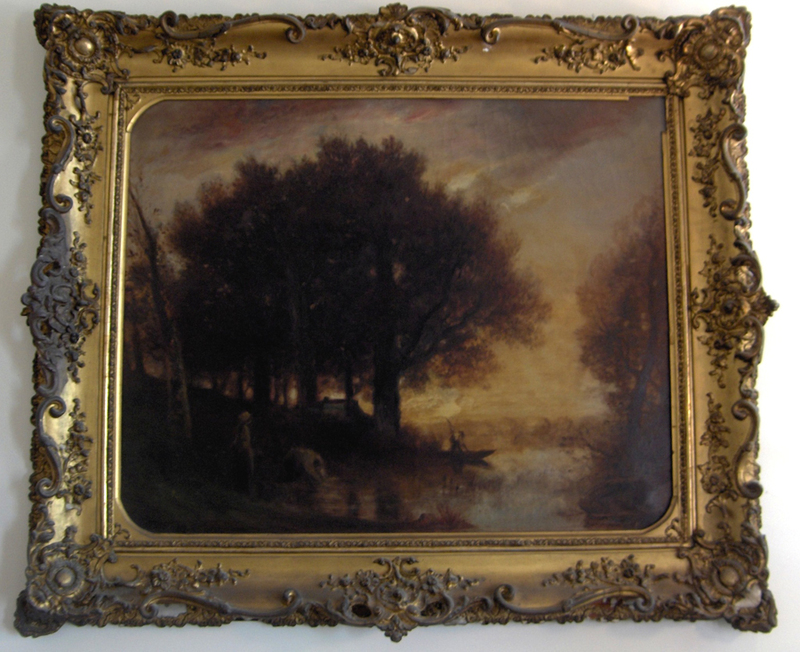 The composition entitled, “Landscape with Tree” was painted while he was in France. 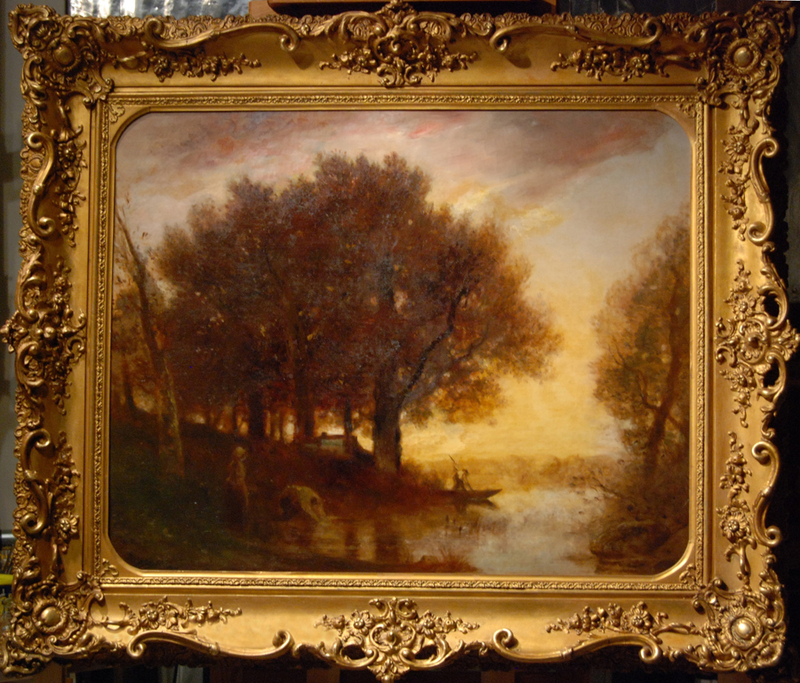 The frame appears to have been original to the painting and is very similar to Munger frames from other paintings he did while in France. Nothing is known about the maker of the frame or its country of origin. Gilbert Munger – Munger was born in Connecticut in 1837. At aged 13 he moved to Washington, DC to apprentice as an engraver for the Smithsonian. He worked there for 10 years and then was employed by the Union Army during the Civil War. While working on the defenses of Washington he learned to draw and paint. After the war he moved to New York City and established his own studio. He then traveled to the west in 1869 with a geology team where he independently painted in Yosemite, the Sierra Nevada Mountains, the San Francisco Bay area, Oregon, and Washington States. Following this trip he settled back in New York City and then eventually moved to Europe in 1877 establishing London as his home base. During this period he traveled to Scotland, Italy and then Paris. He returned to the United States in 1893 and died in Washington, DC in 1903. He is particularly known for his realistic and Barbizon style landscapes. The frame was made of pine and was built up with gesso. 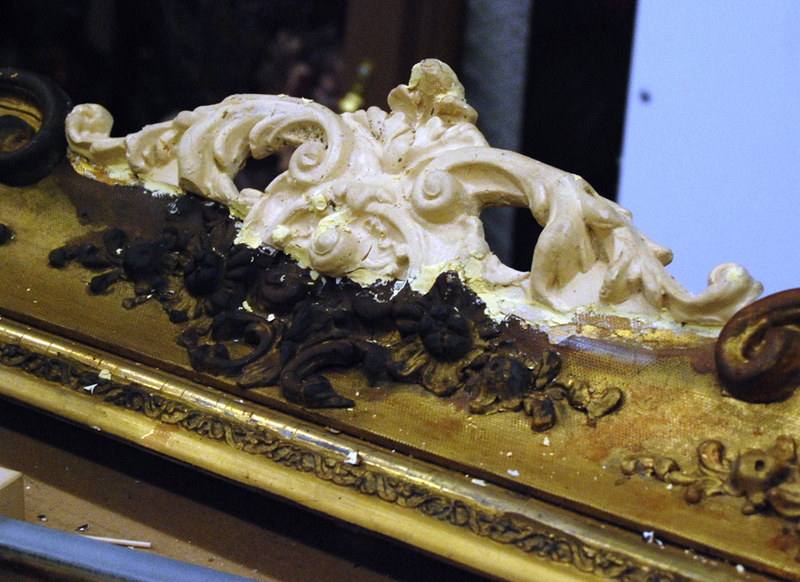 Decorative ornamentation was made using gilder’s composition, which was coated with a grey bole layer and later finished with gold leaf. It measures 48”h x 60”w x 5 ½”th. 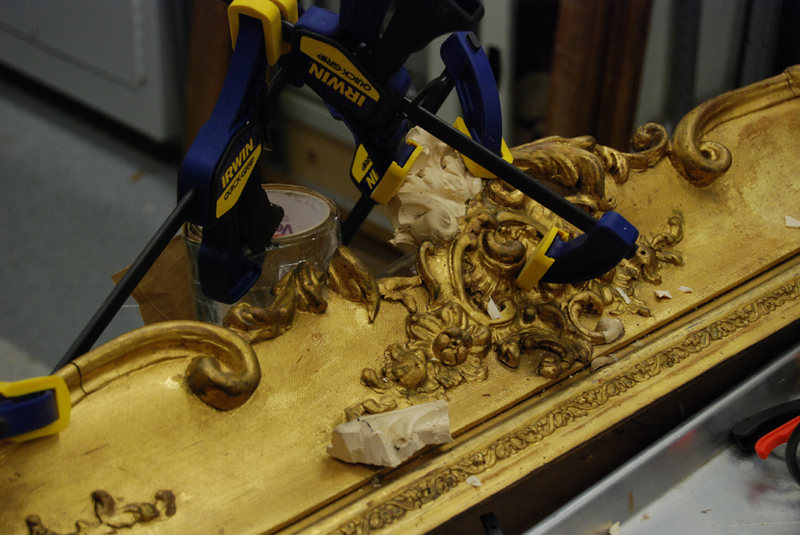 Gilding was applied using oil-based size for ornaments, and water-base size for flat surfaces and highlights. The water gilding on the ornaments was burnished to a high sheen. Through the years some of the protruding corner and side ornaments were damaged or broken off. 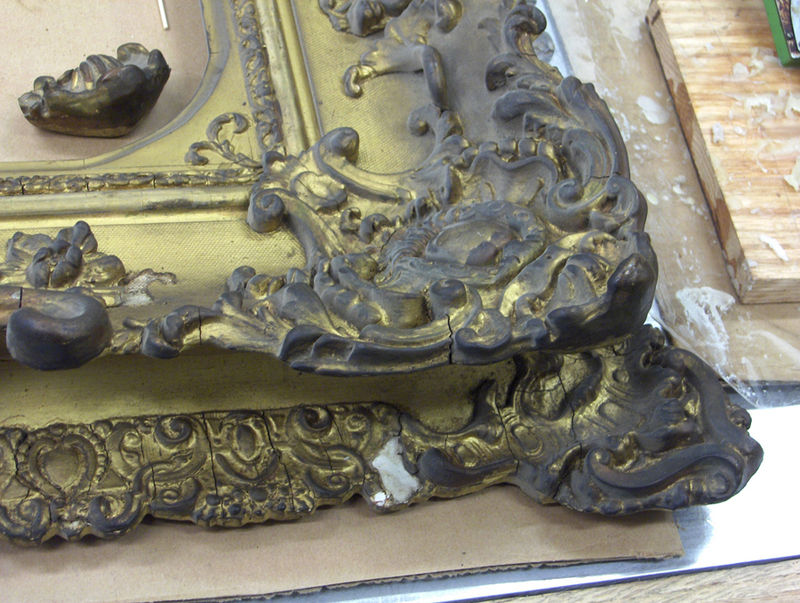 The frame was poorly repaired with crudely formed replacement ornaments and was overpainted with metallic paint, which had tarnished with age. 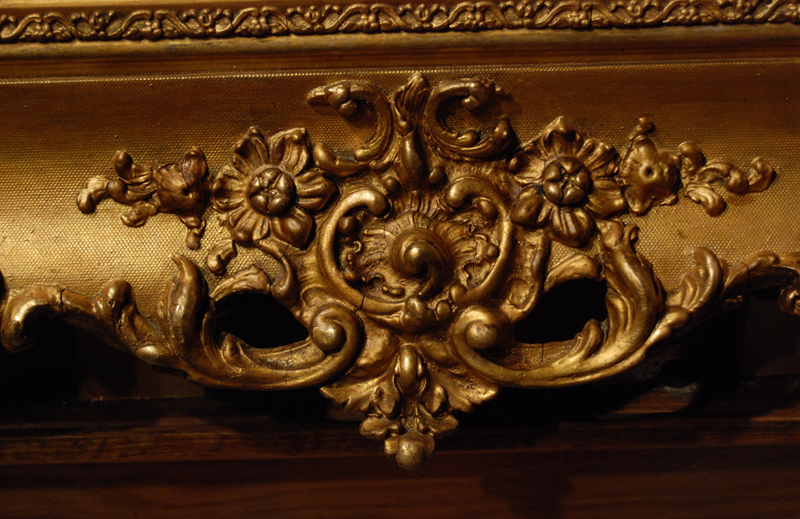 The frame was extremely dirty with heavy oily black build-up of soot on all ornamentation. The upper right inner curved corner spandrel was missing. 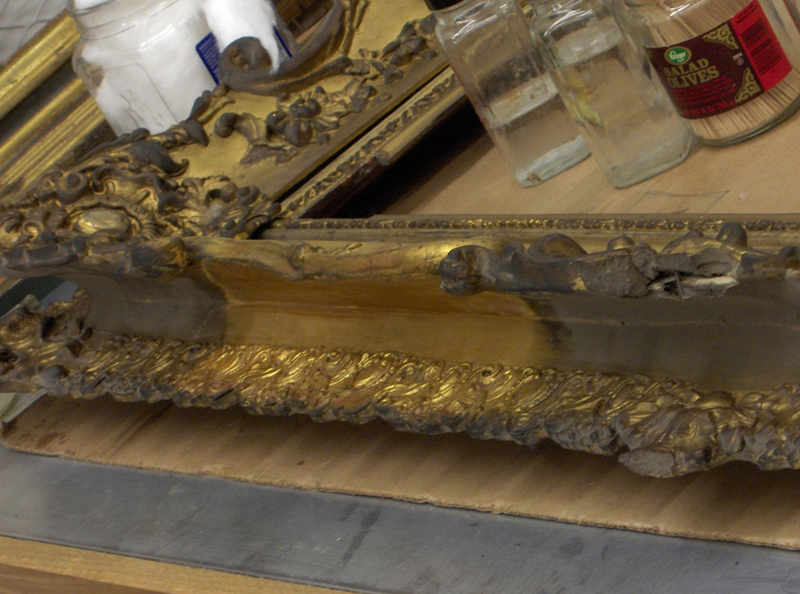 Several newer losses in decorations were noted as were normal cracking and shrinkage of ornamentation throughout the frame. The artifact was documented with a written report and digital photography, before, during and after treatment. The painting was removed from the frame and treated separately. Heavy oily soot and dirt layers on the frame were removed with detergent and the metallic overpaint was dissolved with organic solvents. Crudely cast replacement ornamentation was removed. 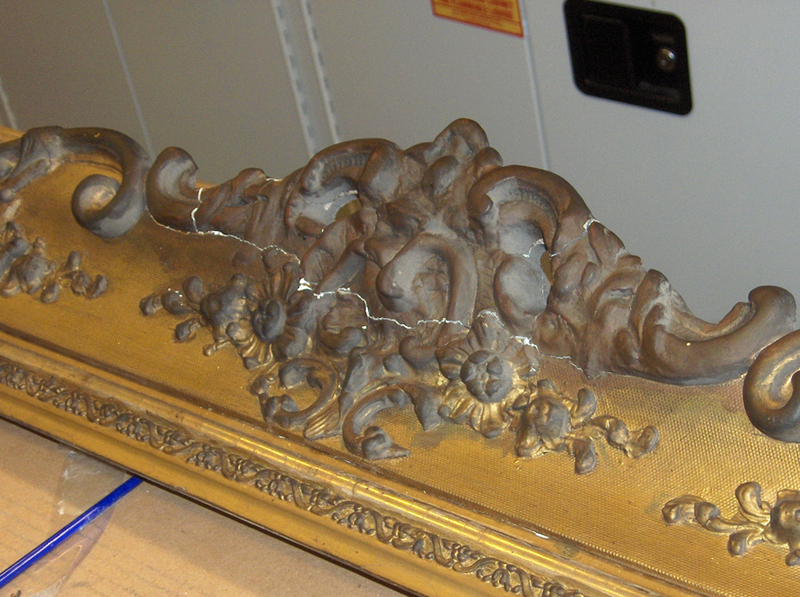 Replacement pieces were made from molds taken from intact sections of the frame. New pieces were cast using a two part epoxy resin adhesive, trimmed to fit, and were attached using polyvinyl acetate adhesive and gesso. The missing corner spandrel was made of pine and was attached in a similar fashion. Remaining losses and cracks were filled with gesso. All repaired areas and castings were sealed with varnish. New gesso, castings, abrasions and gouges were inpainted with mica powders in a varnish medium. The frame was given a spray coating of varnish and a brush coating of toned microcrystalline wax, which was then buffed. The painting was reinstalled in its’ frame using brass mending plates, braided picture wire, “D” ring hangers and Coroplast corrugated backing board.